According to sources from wikipedia.org, Moai are stone statues on Easter Island, in the southeastern Pacific Ocean. Each moai is made out of one large stone. Most were made from the volcanic rock in the Rano Raraku area of the island. When, why, and how they were made is still a mystery today. It is believed that they were made almost 1000 years ago by Polynesians, who lived there at the time and were made to honour their ancestors (older family members long dead) and bring good luck. Little information about the Moai were then inspired us to make it into a powerpoint template. Where Moai background was used as a template and made ​​of vector shapes. 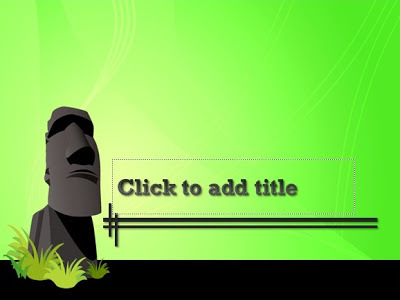 The Moai powerpoint templates have 2 different background, the dominant background color of green and black.